Copper must be considered as a "live" metal; i.e., one which not only moves under temperature variations, but also has a large amount of ductility and tenacity. It is this characteristic which allows the metal to "flow" while adjusting itself to temperature stresses, and prevents the occurrence of internal strains which result in failure. Too much emphasis cannot be laid on this feature. Careful planning for it when applying flashings of copper means a satisfactory job. A strip of copper measuring 1 inch at 60° F. when cooled to 0°F will contract in length an amount equal to L x 60 x .0000095, or 0.00057 inches, and the length of the strip will become 0.99943 inches. If the temperature is increased from 60°F to 120° the length will become 1.00057 inches. Assume that the copper strip is held securely to its original length. The modulus of elasticity of annealed copper is 18,300,000. The stress in the strip due to a change in temperature of 60° may be computed as follows. F = E x N, where E is the modulus of elasticity and N is the linear change. 18,300,000 x .00057 = 10,431 pounds per square inch. As the breaking strength of annealed copper is 36,000 pounds per square inch and the yield point somewhere in the neighborhood of 20,000 pounds, it is evident that in a range of 120° F change in temperature (from 60° down to 0° and up to 120°) the factor of safety varies from 2 to 3½. Were all copper applied at a temperature not greater than 100°F there could be no failure directly due to expansion and contraction, for the elastic limit and the breaking strength would never be exceeded (in a range to —20°), and there would be no stretching of the copper. Sometimes, undoubtedly, the temperature of the sheets at the time of laying is slightly greater than 100°, and the temperature range on roofs is large, measuring in one instance 170°, from —20° to 150° above zero. However, even under these extremes, copper does not fail, because it is not stressed to the breaking point. All building materials expand and contract, and the change in length of any one is relative to others to which it is attached. The co-efficient of expansion of concrete is 0.00000795. Copper laid in a concrete gutter has a coefficient, therefore, of .0000095 - .00000795, or 0.00000155, and the stress in copper laid at a temperature of 100° is, at — 20°, only about 3,400 pounds per square inch, giving a safety factor of from six to ten. When laid on wood, which has a small coefficient, the stress on copper is within the bounds of safety. If the stresses due to expansion and contraction alone are considered it must be apparent that the failure of copper due to temperature changes alone is an extremely rare occurrence. When, however, a sheet is partially constrained, and a point is provided where the cumulative movement due to temperature changes can create a hinge action, fatigue will eventually destroy the ductility of any metal and fracture will ensue. Large steel-framed structures are usually built with expansion joints to allow for movement in the frame. Where copper-lined gutters or cornices, etc., are used with this type of structure it is necessary to provide expansion joints at the points where they occur in the building. These are built in the usual manner, as is shown in Fig. 83. The gutter-linings are turned up normal to and slightly higher than the depth of the gutter, the ends are bent at an angle of 90 degrees to the vertical, and a cap is locked over the top. The joint is designed to allow a small space (say ½ inch) between the vertical sides when fully expanded, and the length of the flanges and width of the cap is calculated to take care of the full contraction of the metal. This type of expansion joint is sometimes used in large built-in gutters to provide for movement in the copper. These are spaced from 25 to 50 feet apart, and are claimed by their exponents to be the only solution of the "built-in-gutter" problem. Fig. 83. An Expansion Joint. 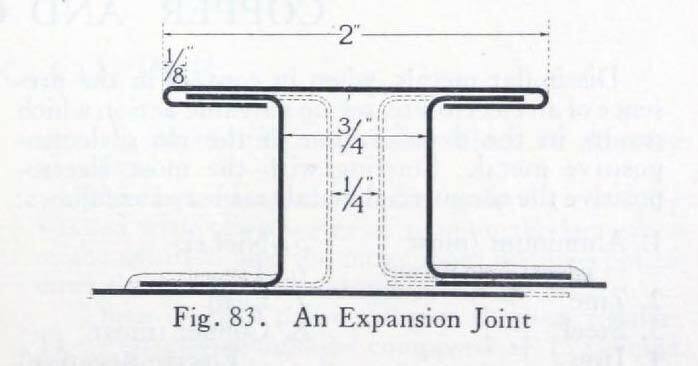 force of expansion and contraction will overcome the frictional resistance of the locks in such manner that the whole amount of movement will evidence itself at the expansion joint. A 50-foot stretch of gutter would move nearly ¾ of an inch during normal seasonal variation of temperature. This represents a change in length of 1/64 of an inch per foot, an amount which is easily taken care of at the seams of the individual sheets. Especially is this true when one considers that this expansion is relative to the supporting structure, (as discussed elsewhere), and that the actual change in dimension per foot is seldom more than 1/200 of an inch.